What is Outlook Sync in AgencyBloc? Outlook Email Sync is an integration with Windows-based desktop versions of Microsoft Outlook. Download our Microsoft Outlook Add-In to sync your Outlook emails to AgencyBloc. We built a Microsoft Outlook Add-In that you can use to sync Outlook emails to AgencyBloc. Currently, we only support Windows-based desktop versions of Microsoft Outlook 2010 or newer. With AgencyBloc, you are able to download our Outlook Email Sync Add-In, install the Add-In file into Outlook and you are ready to start syncing. Sync your Outlook emails as activities to create assignable to-dos and reminders. 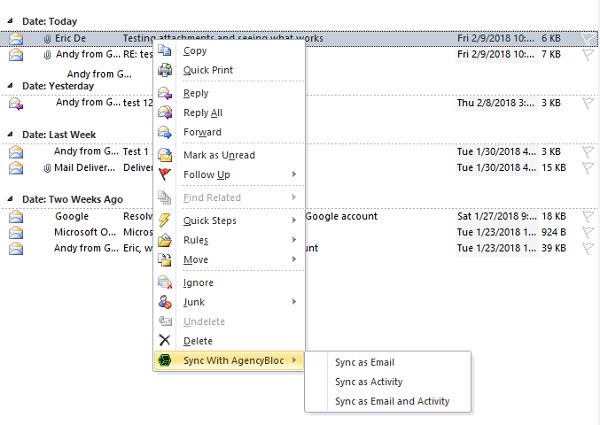 Sync as emails to create copies that include the original message and attachments. Synced activities and emails will automatically associate to contact records in AgencyBloc. Download the original Outlook email from a synced activity or email in AgencyBloc, and pick up where you left off in your Outlook email client. There are 2 ways to sync - manually or automated. Manually - choose an email or folder you want to sync and right click on it and choose Sync With AgencyBloc. Automatically - set up a folder in Outlook to sync automatically whenever an email is moved into it. Any emails moved into that folder will turn into activities or be stored as emails in AgencyBloc. In some cases, the GBS Add-In button isn’t enabled on nested subfolders, depending on the number of levels. The add-in sometimes disappears and needs to be re-installed as well. This typically requires a Support Tech to get involved to resolve.